What Is the Date of 2018 Easter? Before setting out the best Easter gift ideas this year, let's first learn something about it. Easter (Pasch/Pascha/Passover), is the anniversary of the Resurrection of Christ, observed on the first Sunday after a full moon (on or after March 21). Easter is a non-fixed feast, the date of which is not the same each year and is different based on Julian calendar and Gregorian calendar. 2018 Easter date is on Sunday, April 1 . What are Traditional Easter Customs? Attending sunrise services, exclaiming the Paschal greeting, clipping the church, Easter parades, decorating Easter eggs, egg hunting, the Easter Bunny, and so on. What Kind of Easter Gifts Do You Prefer for Your Kids? Traditional Easter Gifts: Undoubtedly, good Easter gift should include those related to spring, hope and rebirth, like eggs, chick, bunny, flowers (esp. Easter Lily). They are all classic and infalliable presents even for Christians. Derived Easter Gifts: Meaningful Easter gifts can be derived from the traditional Easter elements. For kids, chocolates or sugars in the shape of eggs and bunny are interesting. Easter relevant fluffy toy is also great. You can even paint pictures (e.g. of your child’s face) on small eggshells and strung them into a necklace. (1). Watch a fantastic Easter movie/animation with your baby. Accompanying your kid is very vital for his/her healthy growth mentally. Believe me, children like easter movies (or the new spring movies)! You can choose to take him/her to the cinema or range a comfortable home theatre. For example, if ripping kids' Easter movie DVDs to Apple TV or HDTV, your family may enjoy an ads-free, HD and full-length film more relaxedly with WinX DVD Ripper Platinum. Get a new and valid giveaway license from official website. 100% safe and clean. Get WinX DVD Ripper Platinum Full License. Life time free upgrade to latest versions. Extra discount. 60% off here only. (2). Take kids to visit cherry blossom in such a beautiful flowering season as a unforgettable travel is not a bad idea, which embodies the hope in spring and in life. (3). 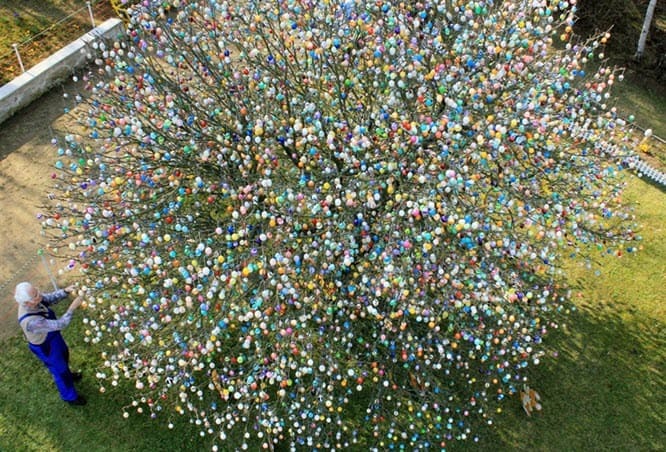 Decorate trees in your yards with colored eggs and hold an Egg Tree Party. Invite other parents and children to come. Both adults and kids can sing, dance and play games besides the trees. You may also hide the prepared colored eggs in the grass and let babies search and hunt eggs. (4). Attend Easter egg rolling activity, esp. 2018 White House Easter Egg Roll which will be held on April 2, 2018 and be live broadcasted, feature live music, sports courts, cooking stations, storytelling and Easter egg rolling, with the symbolization of being health and active. - Create Easter video clips: select the most wonderful and interesting video clips from all the videos you captured, combined them into one and make a complete video. An HD video converter can help you easily split videos. - Convert HD Easter videos: supposedly, most of the Easter videos of your children were shot by your HD camcorders, which are in MTS, M2TS, AVCHD, MOD or TOD formats. These videos are difficult to be edited and played on computer because of video format compatibility. And such kind of video file is also too big to upload or send for sharing. So you need an HD video converter that can both convert HD Camcorder videos to any other video format and compress HD video to smaller size. - Create Easter Video DVD: you may choose to burn Easter videos to DVD with a free DVD burner software that also supports adding own subtitles, pictures and music in the DVD. All in all, there are always wonderful Easter deals on the internet, such as Digiarty's Easter giveaway that is in full swing. The ultimate DVD ripper software capable of ripping the content of any DVDs to AVI, MP4, MPEG, WMV, MOV, FLV, 3GP, etc. Users can painlessly rip DVD (even Disney encrypted DVD) to iPhone, iPod, iPad, iPod Touch, Apple TV, Android smartphones, tablets, HTC, Samsung Galaxy S series, mobile phones, Sony PSP, Zune, etc. It can also copy DVD to ISO image file or DVD folder, merge DVD titles, and more.